Well, today is the 25th and do you know what that means? It's payday! It feels like this month has gone so slow and the last week even more so. I won't lie to you, living off dried noodles and soup has not been fun. But alas the time has come, my bank balance is temporarily generous again and I can not only buy some fruit and vegetables; that my body is screaming for, I can now buy a couple more additions into my autumn wardrobe. 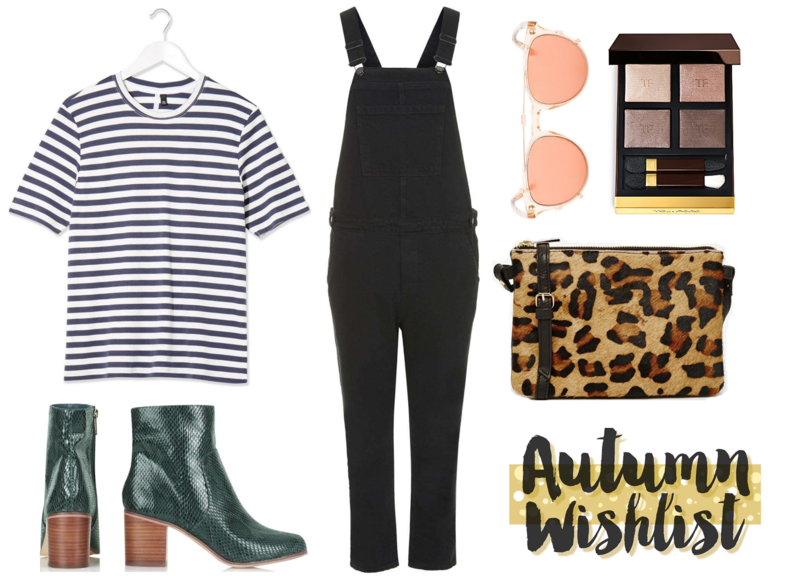 Let's talk about an absolute must-have combination for AW '15, which has to be black dungarees paired with the classic breton t-shirt (or long sleeved if you would prefer). I really loved this combination already throughout the colder days this summer, but there's something so classic about wearing it with a red lip and pointed lace-up flats (a pair that's a steal at £20!) that make it so parisian and chic. Minimal effort to look super stylish really does makes it a fashion winner in my eyes. Plus with an additional of leopard print like the cross-body bag in my wishlist and a pair of heels, it would make the whole look the perfect outfit for a transition from day-to-night. Finally, I am well aware that I do not need anymore sunglasses. However when I find a pair that are designed inspired, rose gold AND only £15?! I'm sold. They're pretty too, who cares if I only had one set of eyes. Am I right? Some people may think I'm a little nuts with my spending habits but at least I'm consistent, haha. One day I'll figure out a way to be a saver not a spender. One day. It's feels really great to post again so soon. I've missed you guys. Speak soon! My blog layout also has had a slight re-vamp as Sunday was dedicated to getting back on track. It's now mobile friendly and little tweaks here and there. Hope you like it. Gorgeous picks. I love those dungarees. I really want a pair but I expect I'd wear them constantly, and sadly they're not very work appropriate. I love dungarees! I'll have to check these out! amazing picks. I have my eyes on those boots. Kinda in love with those boots already!